First of all, it’s a one time only deal – boo! 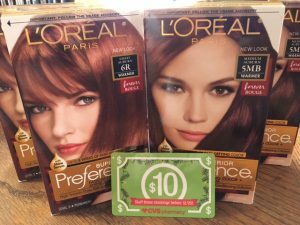 Bought four L’Oreal hair colors for $32, used two 2/$6 4/8 rp coupons plus a $9 Beauty Club ecb from today’s scan at the Machine Coupon Machine (also got another 2 Free Hair Color Items coupon). $11 subtotal and got the printed $10 ecb which I had them convert to the above card which works for paying nasty high tax. Even though I can’t get another card, I’m still earning free hair color with my purchases plus Beauty Club ecbs, so I’ll scan in a couple of days and see if I get another Freebie hair color coupon.